Blinding trachoma, the world's leading cause of preventable blindness, brings extraordinary human suffering and economic devastation to tens of millions of people, mostly to women and children in poorer countries. A new global strategic plan— 2020 INSight—created by an international coalition of partners lays out specific actions to take and milestones to meet that could lead to elimination of blinding trachoma by the year 2020. Water-related diseases take an enormous toll on the lives and wellbeing of children worldwide. The U.S. Fund for UNICEF works in partnership with the International Trachoma Initiative (ITI) and Pfizer Inc. to eliminate blinding trachoma—a water-related disease that is the world's leading cause of preventable blindness. Guest blogger Dr. Danny Haddad is the director of ITI. © Mark Tuschman for ITI | Face-washing is a critical part of the SAFE strategy to eliminate blinding trachoma, a preventable disease that affects mostly women and children. Blinding trachoma, the world's leading cause of preventable blindness, brings extraordinary human suffering and economic devastation to tens of millions of people, mostly to women and children in poorer countries. Children get infected with trachoma at an early age and develop vision loss and blindness later in life. The path to blinding trachoma starts with a benign infection of the eye, appearing in children as a chronic inflammation of the eyelids. But repeated re-infection starts a downward spiral and causes scarring of the eyelid, which leads to painful contact between eyelashes and the eyeball that has been described as if "thorns were scraping my eyes every time I blinked." An estimated 320 million people live in areas where they can be exposed to trachoma, a Neglected Tropical Disease (NTD). 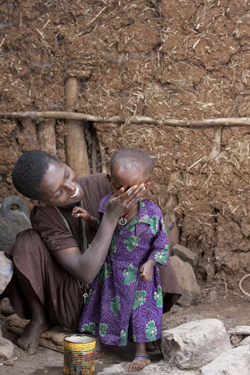 Trachoma blinds one person every 15 minutes and makes one person experience severe sight loss every four minutes. Over 8 million are in the final, painful stages of this eye disease and require surgery to prevent them from going blind. Many more people are affected indirectly, including children deprived of education and other personal development because of the care they provide to help parents at home. A new global strategic plan— 2020 INSight—created by an international coalition of partners lays out specific actions to take and milestones to meet that could lead to elimination of blinding trachoma by the year 2020. What is needed to reach this ambitious goal? Four key elements: country leadership, international coordination, logistical and planning support, and adequate funding. The goal to eliminate blinding trachoma in less than nine years is, indeed, ambitious, but it is also achievable. The primary reason for hope is the World Health Organization (WHO)-endorsed SAFE strategy. SAFE brings Surgery, Antibiotics, Facial cleanliness and Environmental improvement to the poorest communities where trachoma is most likely to be found. To implement SAFE, national governments and non-governmental organizations around the world are uniting like never before. The good news is that nine countries with trachoma have already reported achieving elimination targets. More than 80% of the burden of active trachoma is now concentrated in 14 countries, where immediate action is needed. Scaling up public health interventions described in the SAFE strategy, including antibiotic treatment with Zithromax®, which is generously donated by Pfizer Inc, and improved access to water and sanitation, are the most crucial elements in the fight to stem transmission. As part of its commitment to securing a better future for children, the U.S. Fund for UNICEF works closely with the International Trachoma Initiative and Pfizer Inc on supporting the SAFE strategy. 2020 INSight lays out five guiding principles that provide a framework for making progress on the path to elimination: urgency for action and scale-up; accountable ownership by countries so they can integrate actions into the national health services; integration so that trachoma-focused efforts are aligned with activities for other NTDs, eye care and development strategies; efficient, coordinated partnerships with all stakeholders; and tailored interventions to meet local needs and context. Those of us involved in the fight against trachoma are hopeful. Trachoma was named as one of five priority diseases for the VISION 2020 “The Right to Sight” global initiative for the elimination of avoidable blindness launched by WHO and the International Agency for the Prevention of Blindness back in 1999. There has been much great news to report over the past 12 years. 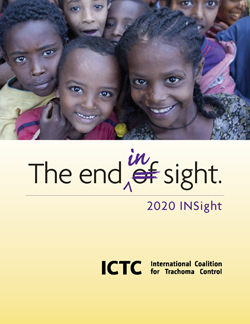 If the global community uses the new strategic plan — 2020 INSight— to focus time, attention and funding, trachoma doesn’t stand a chance. You can learn more about UNICEF's Water and Sanitation efforts, including what you can do to help, at www.tapproject.org; to learn more about blinding trachoma, visit www.trachoma.org.